Let’s admit, if you’re living in a developing country, a bike tourer has limited options when it comes to quality gear. While there are some stores that carry things you need, the prices are quite high which can turn off those interested in the discipline. Enter Ryan Blanco’s Workbench Fabrications. Ive heard of his works from fellow cyclist/tourer JT Tanangonan and I was amazed by the craftsmanship done on the racks. I got in touch with him and was quite surprised he was my student in 2nd grade way back early 2000s! Using cold steel for his creations, his racks may be a bit heavy for the weight weenie, but these are definitely bombproof! Also, he gets to have these powercoated for custom colors you want. he does everything from fitting, cutting, welding and the works! So what are you waiting for? Drop him a line and check his stuff out! I got this bike in Febuary 2016 and among my rigs, this remains to be the last one that hasn’t experienced a multiday tour. Initially, when I got this, the model was M6R and did a conversion of the handlebar (the P Bar) for touring purposes. With a Sturmey Archer 3 speed Internal Gear Hub and External Cogs 14 and 16t combined with a 2 speed derailleur, the bike has a total of 6 speed configurations. Noticeably in folding bikes, the long stem tends to make the handling a little twitchy and the same is noticed with the Brompton. With a 50t crank, it does take a little more effort for the bike to power and the shifting of gears may make riders feel the difference between using an IGH and regular derailleur systems. One noticeable feature is that every shift in gear may tend to be quite abrupt-either too light or too heavy. In addition, the steel construction of the bike makes it stiff yet a favorable flex is felt similar to other steel bikes (i.e. Surly). But while the stiffness is a good thing, the small frame and fork and wheels tend to absorb vibrations weakly making the rider feel every pothole or bump on the road. The bike has a long wheelbase comparable to bigger wheeled bikes making the ride quite stable. The 16inch wheels provide a much more sleek feel and this makes the Brompton shine as it is easy to maneuver especially in heavy traffic. In a tour, small wheel bikes may obviously be an unlikely candidate but they are worthy for long distance explorations (ive done one in Pagudpud using a Dahon C7A) since they are easy to transport when folded and when things go wrong, you can always bail out with a small foldie! For the Caliraya trip, the Brompton was very much agile in terms of maneuvering through traffic. It was quite easy to go through small spaces as you move along with other vehicles. The standard brakes that come with the Brompton also provide great stopping power. The feel is comparable to those high end v brakes-XT/XTR/Avid SD7s. As regards its performance in climbs, the gearing may feel a bit inadequate as I had to exert effort in certain gradually elevated portions of the route. It may be safe to say that it may be a bit difficult to spin the rig given the large toothed Chainring and abrupt changes in gearing. However, the bike appears to be fine for moderate/light stretches of climbs. For this tour, there are several features I’d like to zero in on specific parts of the bike. Among the different handlebars offered by Brompton, this one can be considered as their touring bar. Similar to butterfly handlebars (only oriented vertically), they afford several hand positions providing comfort during the whole stretches of the ride. Since the rider’s position is upright on a Brompton, the P bar allows you to hold on to the bottom part of the bar similar to dropbars making your posture a bit more aggressive-great if youre cruising on open road to minimize the effect of headwind. Also, the P bar provides a lot of mounting space for lights and other stuff. The Brompton has its own specific rack bundled with a pair of bungee cords for Cargo hauling. Though the rack may accommodate a drybag, mounting third party rack bags or panniers may be a problem as there is very little space between the rack and the rear fender underneath as well as the railings are quite thick compared to other racks (ive tried installing a Deuter rack bag and it just didn’t fit!). Some would use dry bags or a backpack on top secured on the saddle but I used a new set of panniers which I will get into later. One major concern among Brompton users is the difficulty in changing flat tires. In my rig I used Schwalbe marathon racers with Dr. Sludge sealant inside the tubes. I’ve been using this since March 2016 and I haven’t experienced a flat since then. Though it tends to corrode/contiminate the valves after a couple of months, cleaning it can extend the life of the tubes as well as the sealant. Overall while the bike has potential for longer tours, operating this rig may require the rider more effort and getting used to. This bag is custom fit for the front block carrier of the brompton and ive placed my electronics and other personal stuff. True to the company’s assurance that their products are waterproof, my stuff remained dry amidst two days of light-moderate rain. It is spacious and does not seem to cause problems when riding against strong headwind. For this one, ive placed my tubes and Brompton Tool. Attaching the bag to the seatpost and frame, the bag is quite sturdy and didn’t pose problems while pedaling. Surprisingly, the thick fabric has a high level of water resistance, when we experienced constant raining, the contents remained dry. As part of expanding the bikepacking line of Conquer bags, the dispatch lite panniers (I just gave a name to it!) is a response for riders who need bags for their small wheeled rigs or those going on extended tours but need a little extra space for their stuff. I’d say the bags are similar to Porcelain Rocket’s Micro Panniers and Revelate Designs’ Nano panniers. That is, if one finds a fully racked setup too heavy or a rackless setup very limiting, you may want to go “semi-racked” (perhaps using a low rider or light/small rear rack for extra stuff). In terms of volume, I suppose you can store as much as 2.5 liters in each bag (5L in total). In my case ive tried stuffing 2 days of clothes on bag, my Klean Kanteen (500ml), slippers, extension cord/multi USB port and charger, toiletries kit in the other with space to spare. I would assume that for a heavy packer like me using a Brompton in a longer tour, I’ll probably stuff 4 or 5 days of clothes in the bags and have a saddlebag to store utilities and other stuff there. The bags blend seamlessly with the Brompton as they attach easily to the rack with the clip straps. Though it touches the IGH chain, it doesn’t affect the shifting performance (and ive run through unfine contours of pavement, some puddles of water in the street and several potholes on the route). During the ride, the bags didn’t sag nor were they a problem when banking during the descent from Caliraya (they didn’t touch the ground) as it had several inches of clearance from the ground keeping your stuff safe. While the bag may seem perfect, it is not without problems. Several improvements can be made with this prototype-good thing Conquer reports this will be released early 2017 (with a price much lower than its big brother-the Conquer Dispatch panniers). The zipper can be replaced with a rolltop strap clip as it helps in increasing storage space as well as water resistance. Since I tried both Velcro and Strap Clips for attachment, the strap clips appear to be better at securing the cargo as well as ease in removing or attaching the bag. Clip straps or Velcro? I’d go with Clip Straps! Though this prototype appears to have certain minor issues, I think this may be the perfect pannier for the Brompton or similar small wheeled bikes (as far as i know, there are no existing panniers for the Brompton). Further, for those needing smaller bags for their bike commutes or extra space for extended tours and not wanting great weight penalties, this should definitely be part of your armory. In sum, given the setup of the bike, gear and ride conditions, it would be good to see how this setup performs in a much longer tour and see how these hold. After the Sagada Loop, I wanted a shorter tour that’ll end 2016 on a high note. During the trip, ive been curious about many biker friends camping to Caliraya, Laguna. Situated approximately 100km away from Manila, I was told that there are several resorts in the area because of the beautiful man made lake that spans several municipalities such as Lumban, Cavinti and Kalayaan Laguna. More interestingly, many have bought houses there decades ago and left them behind and since then, these have been made into vacation homes for people wanting to go camping or a quick getaway from the metro. 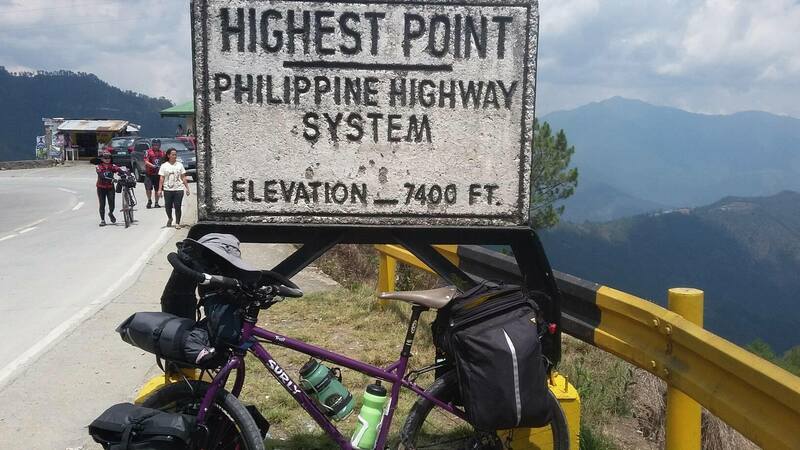 In this entry, I detail our two day bike camp to Caliraya. Though we encountered traffic in Los Banos, the bridge in Bay, Laguna was undergoing renovation resulting in MORE TRAFFIC (one jeepney driver said they have been stuck there for an hour already!) and four of us (Jiggs, JT, Ninfa and I) took a detour to Calauan and ended up in Victoria…Marvin, Jen and Nerica took a different route and ended up ahead of us several kilometers. We regrouped in Pagsanjan and started our climb up to Caliraya…the 8km climb isn’t steep but the first 5 kilometers is a non-stop stretch of curves. Good thing it wasn’t hot and there are small stretches of recovery…What made the climb a bit difficult is rain pouring…it started with a drizzle and eventually it poured heavily prompting some of us to take cover. Jiggs and I arrived last to Soleviento resort and we were transported to the resort via a short barge ride pulled by one of the staff…scary at first because of strong wind but the barge was very secure. Upon arrival we were greeted by the wonderful Bingo! The dog who is a popular feature would always join guests as they arrive/leave the place. It was 6pm already and everyone in the group settled on a table and ordered food…we shared stories about different things over coffee. We all went to bed a little past 11pm. It was raining all night and we all met at the resort hall around 8am, had breakfast as we watched the view as it was still raining… there were other guests in the place that were doing other stuff such as kite sailing and swimming around the lake…on the other hand we decided to chill around until the rain weakened a bit and left around 11am. The trip going down was quite easy and good thing we only encountered strong wind and the road wasnt as slippery compared to the other day. We had lunch at Pagsanjan and rode back home. Though we all thought the trip home was a breeze, traffic was just terrible. Perhaps in the past tours that we’ve done this holds the distinction where traffic was such a problem! Overall, I felt that the trip was nice but it could have been better if it was well timed and well scouted. Soleviento and the lake could have been more enjoyable if it wasn’t raining for the past days but im glad to see new faces join this and the experience going to lake Caliraya is something worth repeating in the future. I remember Kuya Edan (aka Sagada Loopers) telling me that there are cheaper accommodations in Caliraya. That is, there are big houses that have caretakers that will allow you to stay but there’s no cooked food or electricity so camping outside is the go to option. For riders on a tight budget and little bit adventurous, you might want to consider these. After the ride, I realize, the route is a good opportunity for those starting out on touring. The close to 200km trip has a mix of flat roads and climbs (though very short) and varying weather conditions (and even a dog chase!). This may be a good trip for you to test your rig/setup and gear as well as determine group dynamics with fellow riders and of course skills and endurance as you prepare for a much longer tour. Though some may claim that the route can be done in one day, I feel that you really can’t appreciate the place if you don’t stay awhile and go around (not to mention eat good food and interact with locals). One of the staff of Soloviento suggested that prior to visiting it would be wise to give them a call to find out the weather conditions. During heavy rain, Jiggs and I took shelter in one of the houses and one of the locals claim that weather has been fair and rain was experienced for the past month! Personally, I think Soloviento is a well maintained facility. Even if some of the facilities are shared (dining area, bathroom), they are clean and free from flies or crawling insects which can spoil your eating. In Soloviento, the campers are a must try for those who have difficulty sleeping in tents. It has electric outlets, a fan and the beds are quite roomy (at most 4 per camper). Tents are available for rent as well and the staff can even help you out pitch them. The road going up to Caliraya is surprisingly well paved! The view of Laguna is definitely a must see if you’re climbing or descending back to the Metro. Also, consider leaving late morning or early afternoon at most as you wouldn’t want to be stuck in the dark as most municipalities do not have lightposts on the street.